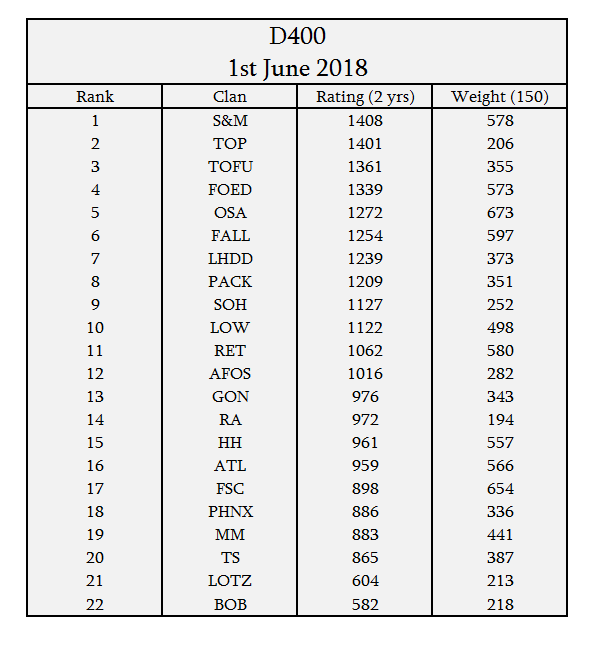 Jplo64 and I have been working on restarting the F400 ranking. We have been using the same formula that Farang was originally using, based on the performance rating formula. See post below for more detailed explanations. 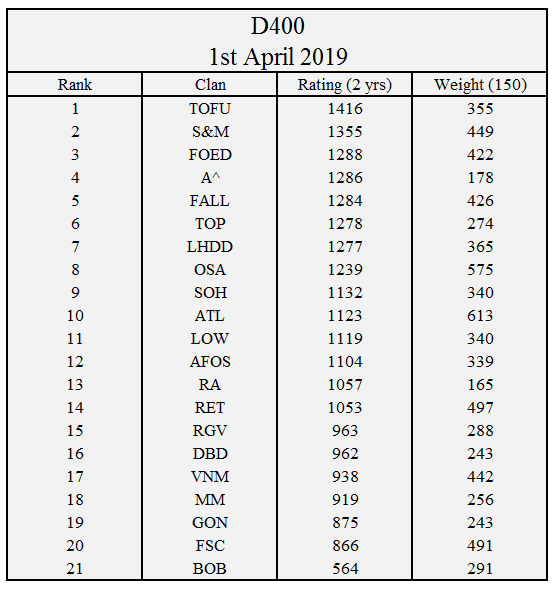 Some parameters or choice made by Farang were unknown to us, so this ranking is working on the same principle and almost the same formula that the F400, but there are some discrepancies. This new ranking will be called D400. 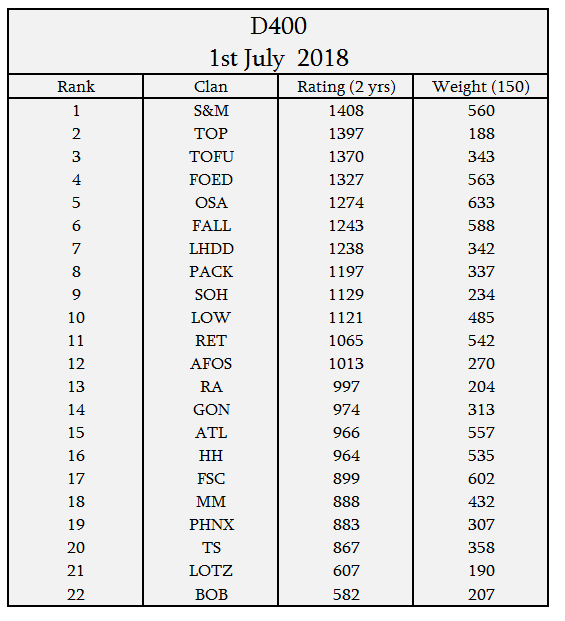 Here are the rankings since April 2018. 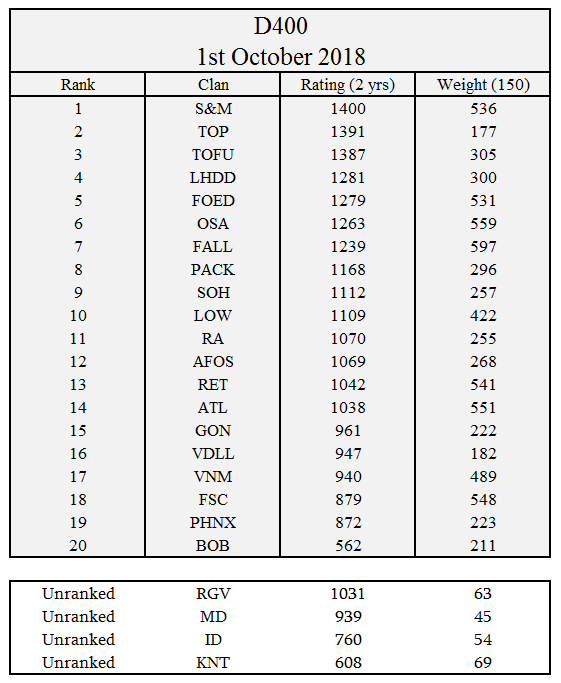 I plan to publish this ranking monthly. I can also publish F41, F12, 1 year ranking and 2 year ranking ( or 10 years rankings, doesn't matter ). 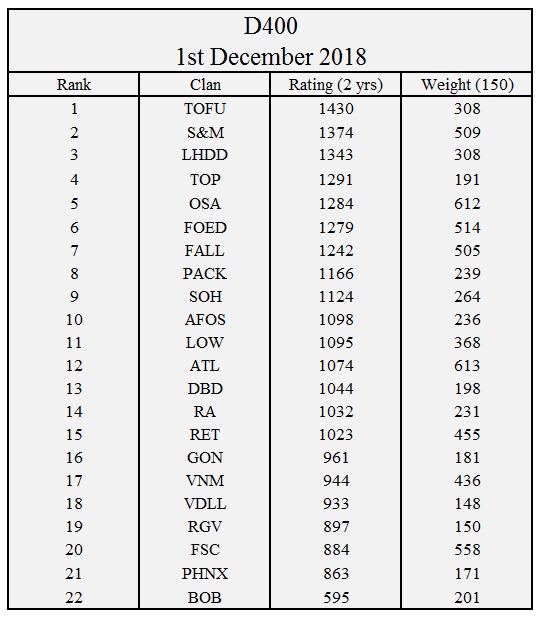 I can provide ranking to specific date in the past if you want. I'll do so unless I get too many requests. 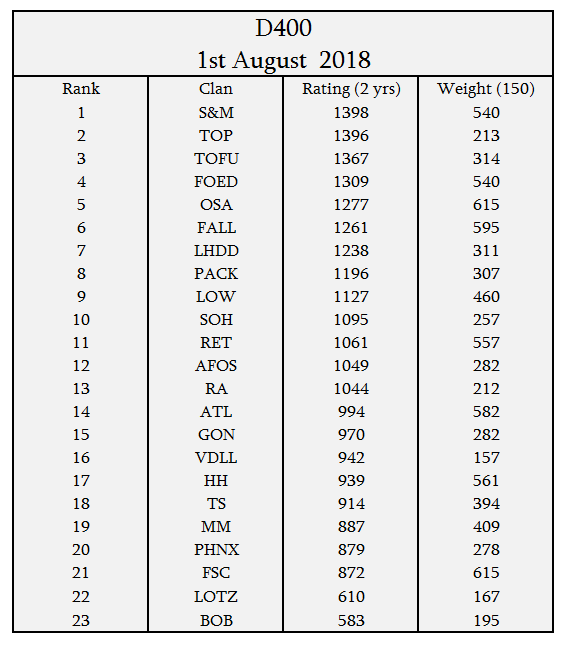 Wars included for 2018 ( Clan1, Clan2, ScoreClan1, ScoreClan2, Day, Month, Year). 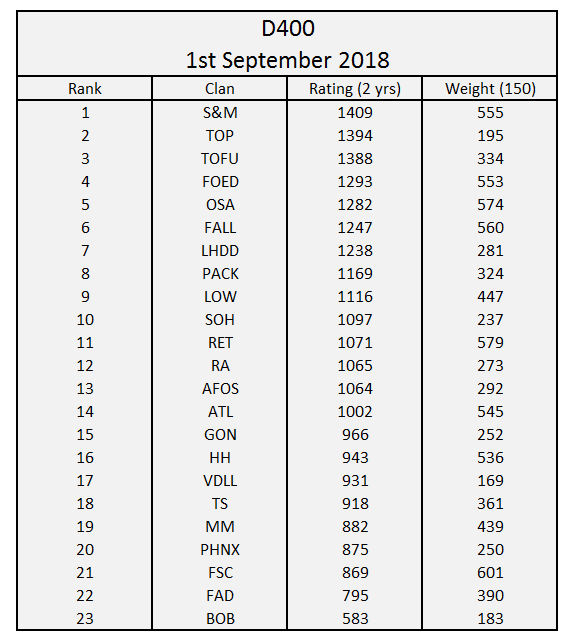 Data File - all clan war included ( very very long spoiler). Last edited by Donelladan on Sat Mar 02, 2019 2:20 pm, edited 24 times in total. 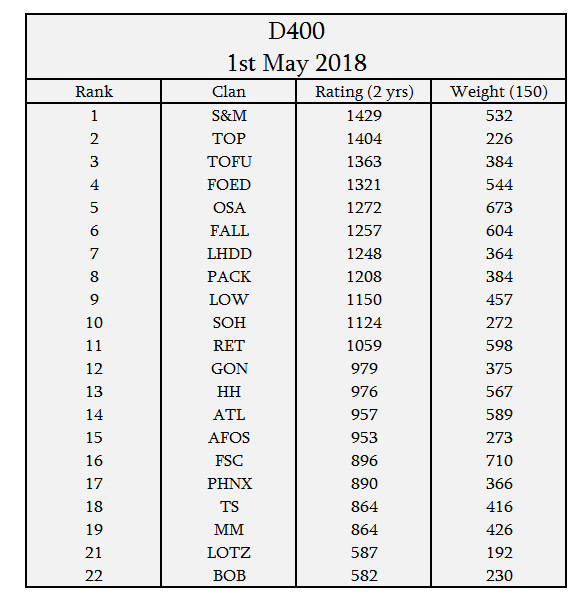 Re: D400 - NEW Clan rankings. Awesome work Don and JPlo! Under the old system wars were not included until they were 100% finished. Is that the case now, or are they included when the victor is known? Last edited by rockfist on Wed Aug 01, 2018 4:32 pm, edited 1 time in total. Thanks for putting the effort in guys. 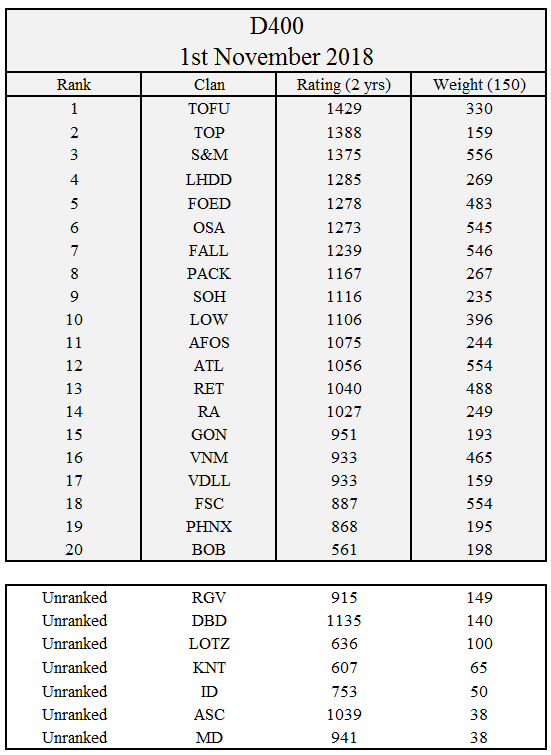 I just added the data file used to calculate the ranking in the first post. ( complete, and for 2018 only). Yes your war against HH is included. But because the finished date is 18 of july, it is only included in the August ranking. rockfist wrote: Under the old system wars were not included until they were 100% finished. Is that the case now, or are they included when the victor is known? I need the score to calculate the ranking. Who is winning isn't enough. 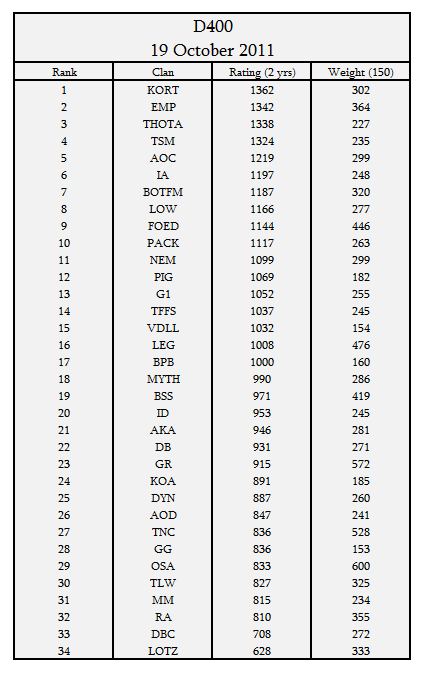 Donelladan wrote: I just added the data file used to calculate the ranking in the first post. ( complete, and for 2018 only). Thanks guys. I just have one request, can we change font? Calibri would do. Nice work guys. I know how much effort went into this. Great job guys, thanks for all the hard work. Thank you both. Great job! Don, just to confirm my earlier pm. About 4 years ago the CD team worked with bigWham to get the F400 rankings built into CC itself. 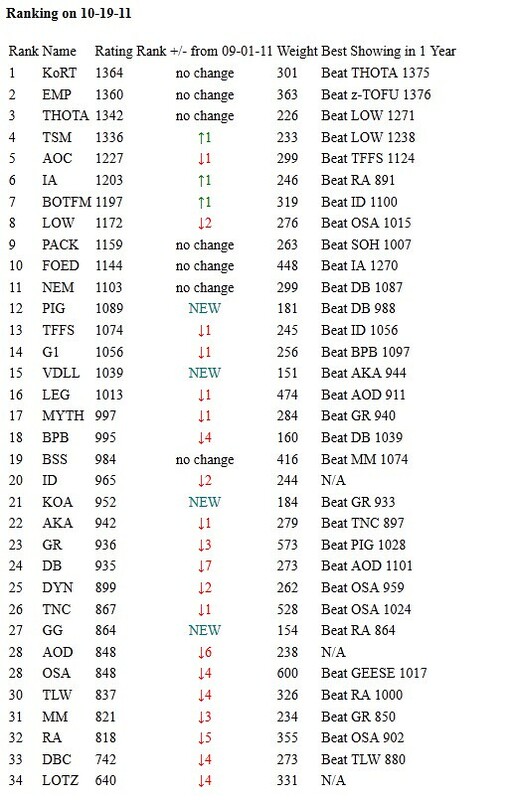 BW developed the system but we just couldn't get the rankings to match, so there was something very clearly wrong with the formula we came up with then. Prior to you developing this system, I was in touch with BW and he agreed to work with the CD Team and JPlo64 in order to revive the original work using JP's numbers. In order to future proof the D400 and have it automated and viewable in the Clans tab. I strongly recommend/advise that the two of you work with BW to achieve this. I understand that comments have been made that BW has been contacted but has not responded. Maybe this could be escalated with DaveKettering. Don't get me wrong, what has been done is amazing. But the site is just as vulnerable to losing it as we were with the F400. Last edited by Keefie on Thu Aug 02, 2018 1:29 pm, edited 1 time in total. Excellent work!! 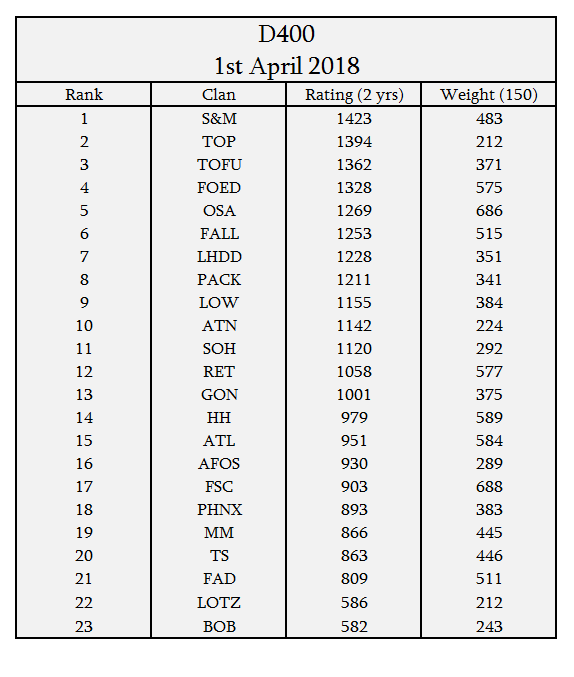 Thanks for a job well done and keeping the clan world relevant! Salut Don & Jplo! Thanks for all your work in getting this on platform! Thanks for your work on this, guys. Any chance to get a Sept 1 update?